"Spiritual Gifts of the 12 Astrological Signs"
Each astrological sign comes with innate strengths cultivated from previous lives, as well as important lessons for the soul to learn in the present incarnation. This book concisely describes the ways to best utilize the qualities you’ve worked so hard to acquire. Every astrological sign is also given spiritual steps to take to grow in directions that will create even greater empowerment, confidence and serenity. In addition to reading about your Sun sign, you’ll learn even more about your soul’s mission by reading about your Moon and Ascending (also called Rising) signs. You’ll be armed with unique information that will help you be more successful on your spiritual journey! 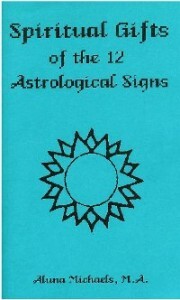 If you would prefer the Spiritual Gifts of the 12 Astrological Signs in a pdf, please contact Ms. Michaels directly at aluna@alunamichaels.com. The cost for the Kindle or pdf version is $4.99.